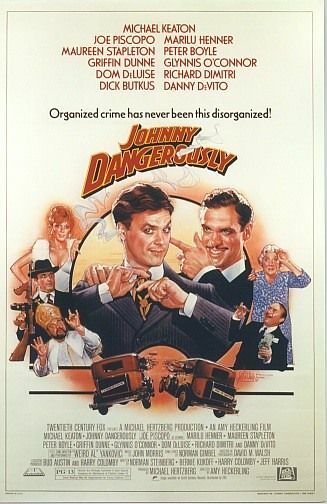 Johnny Dangerously. Edgewood Productions 1984. Michael Keaton, whom I’ve seen in a few different things, and Joe Piscopo, whom I’ve only seen on an episode of Star Trek and some old SNL sketches and couldn’t pick out of a lineup, share a comedy about mob crime. Johnny Kelly joins an organized crime gang to make the money his family needs, mostly for his mother’s many operations. He works his way up from an errand boy to the head of the gang, then his justice-obsessed brother graduates law school and gets a job with the D.A.’s office. Being divided between his job and his family is not where he needs to be, especially with psychotic upstart Danny Vermin in the gang gunning for his position. The strengths of this movie are slapstick, pastiche, and wordplay. The story is kind of weak, but it’s a spoof of the mobster genre, so that’s okay. The humor sells it, but discussing the humor always ruins a few jokes. One of the best is that Danny Vermin’s gun of choice is an 88 magnum, which “can shoot through a school,” but each character has something, like rival boss Moroni’s G-rated sailor’s mouth. A lot of recognizable names pass through. Peter Boyle is the boss of the gang Johnny works in. Ray Walston has special appearances as the unfortunate newspaper vendor who keeps getting hit in the head with papers (but that’s not always a bad thing). And the opening credits music is a song by Weird Al that I never connected with this movie, because I didn’t know it existed. I finally have the context for the clips mixed into the video for This is the Life. I was expecting a slightly more serious story about two brothers on either side of the law pitted against each other, but this doesn’t go in that direction at all. Johnny’s brother Tommy finds out about his other life, Johnny goes straight, Johnny gets framed and convicted, and then immediately Tommy realizes Johnny was framed and starts trying to save him. I’m not sure if it would have been better if they’d focused more on that conflict, because the story is really just a scaffold to hang jokes upon. I think I do wish the story had a little more effort put into it, but the jokes make the thing worthwhile anyway. There are some really good laughs. Watch this movie: With some popcorn and a tommy gun. Don’t watch this movie: with tissues and an Oscar ballot.